This maintenance and Repair Kit contains a COLDWELDING SYSTEM® capable of repairing leaking tanks, pipes and containers in 3 to 4 minutes. Virtually any durable material can be quickly and permanently repaired, even while the surface is wet, oily or greasy. Unlike other products on the market, DURMETAL® Super CA-HD Rapid® works under water or in oil. Capable of stopping leaks. DURMETAL® Super CA-HD RAPID® can be used without shutting down systems. When welding, soldering or brazing is impossible or where explosion and fire hazards are present, DURMETAL® can make that difficult repair. Heating and air conditioning systems, radiators, fuel and steam lines are repaired while on line. Because DURMETAL® Super CA-HD RAPID® adheres to oily, greasy or wet surfaces, actively leaking systems can be repaired with literally no system downtime. Repairs with DURMETAL® are permanent and durable, usually saving the costs of new parts or materials. Roughen the surface and use Special Cleaner (included) to remove excess of escaping media. Mix DURMETAL® Super CA-HD RAPID® and apply to KEVLAR® tape (included). Press onto leak with the patented Coldweld® Tool (included). DURMETAL® Super CA-HD RAPID® can be painted, machined, sanded, drilled, etc. Because DURMETAL® contains no solvents, it will never shrink or dry out. We guarantee the extended shelf life of DURMETAL® as well as the technical data shown in the Table of Physical Properties. Many of our customers have told us that their first repair more than paid for the entire kit in repair cost savings. The remaining material is still available for repairs at any time without a charge to repair budget. Hundreds of Testimonials and Case Histories at Hand. Here are only a few. Sulfur tank: Repaired without draining. Hole 60 x 25 cm, leaking. Savings more than Euro € 115’280.-. Fuel Bunker line on ship: Crack occurred during fueling. Stopped live leak. Saved Euro € 57’640.-. Vital to have DURMETAL® on board. Thanks to DURMETAL® we saved Euro € 1’267.-, repairing a corroded part of a cooling system. Gas leak on Monomar equipment. Savings on material & downtime approximately Euro € 2’073.-. DURMETAL® is always in stock since. 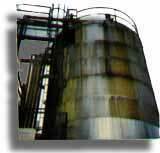 Used to combine permanently any material, metallic or non-metallic, or a combination of material such as steel, cast iron, aluminum, brass, PVC, copper, lead, concrete, glass, wood, rubber, synthetics, and numerous others. Now you are able to stop a leak in a tank, container or on pipes without emptying systems. VELODUR®/DURMETAL® Super CA-HD Rapid® adheres to oily, greasy or wet surfaces. Work can be carried out even on pressurized systems. No fire and explosion hazard. No production stoppage. Fast - easy - safe. For repairs on pipes or general reinforcement use Kevlar Tape with DURMETAL® Super CA-HD Rapid®. Useful for repairing large fractures and replacing blown out parts. Mix VELODUR®/DURMETAL® Standard Base with Fluidizer and achieve a corrosion-proof finish with excellent resistance against chemicals, acids. Use Fluidized VELODUR®/DURMETAL® for repairs within small tolerances, pour it for molds and patterns, and for filling in porosities. To degrease mechanically-prepared, roughened surfaces. Suitable for the entire VELODUR®/DURMETAL® System. 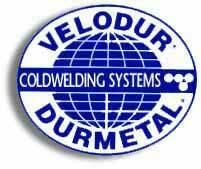 For areas where VELODUR®/DURMETAL® should not adhere. Excellent for replacing stripped threads in combination with VELODUR®/DURMETAL®. No tapping required.